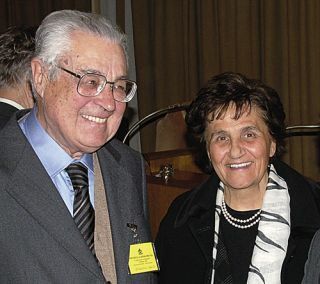 By now you probably know that this year’s prayerful meditations for the Good Friday Way of the Cross at the Colosseum in Rome were written by a married couple. You can find the text here or here. The Cyrenean also brings to mind the faces of all those people who have been close to us at times when a heavy cross befell us or our family. He calls to mind the many volunteers throughout the world who generously devote themselves to comforting and assisting those suffering and in distress. He teaches us humbly to let ourselves be helped at times of need, and to be Cyreneans to others. Pope Benedict XVI’s exhortation at the conclusion of the Via Crucis is also worthy of reflection, highlighting truths that we should never forget or take for granted. 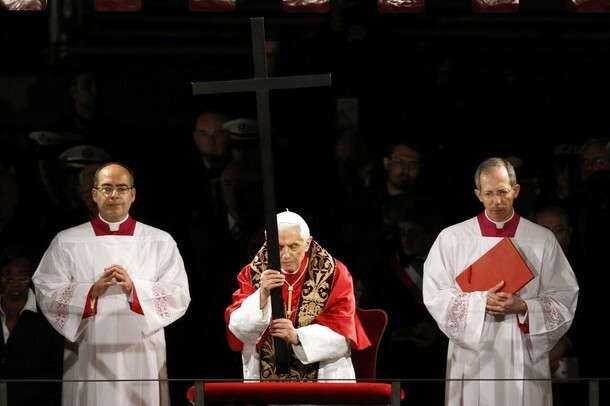 …..Pope Benedict’s Message for Lent 2012. It is tremendously relevant to Community life!! As well as to our lives as Catholics in general. How is your fasting going this Lent? He does not really fast who does not know how to nourish himself on the Word of God. 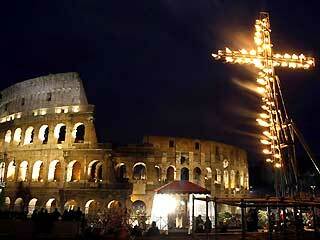 Every year on Good Friday, the Pope presides over the Way of the Cross at the Colosseum. Each year, our Holy Father assigns someone different to write meditations for these Stations of the Cross. This year, the meditations will be written by an Augustinian nun. During Lent this year, I’ve been doing some lectio divina with these meditations as part of my devotions during Lent. Some have proved to be exceptionally fertile for reflection and prayer. They provide an excellent setting in which to contemplate the Face of Christ, to understand his sufferings in a deeper way, and to become more aware of the connections of his passion and death to the rest of Sacred Scripture, Church teaching, and God’s plan for our salvation. Ash Wednesday addresses the heart. Ashes are sprinkled on our heads, but Lent is lived in the heart. God wants pierced hearts. God looks for the broken heart. “Even now,” says the Lord, “return to me with all your heart, with fasting, with weeping, and with mourning; and rend your hearts and not your garments” (Joel 2:12-13). Paradoxically, in order to give God one’s whole heart, it must first be pierced and broken. This is what we mean when we speak of compunction and contrition. The traditional Lenten disciplines — fasting and abstinence, almsgiving, silence, keeping vigil, and increasing the time devoted to lectio divina each day — are not ends in themselves. They are the tried and true means by which one arrives at having a pierced and broken heart, at some measure of compunction and contrition. 1. Fasting and abstinence help to crack the heart’s stony shell; hunger makes one vulnerable. But here is the catch: Our Lord would have us fast as if we were feasting. One of the fruits of fasting is spiritual joy. Fasting cleanses and refines the palate of the soul, making it possible to “taste and see that the Lord is sweet” (Ps 33:9). “When you fast do not look dismal . . . anoint your head and wash your face, that your fasting may not be seen by men but by your Father who is in secret, and your Father who sees in secret will reward you” (Mt 6:16-17). The fasting pleasing to Our Lord makes the face cheerful and lifts up the heart. Fasting (going without eating) and abstinence (not eating certain foods) need not be enormous feats of ascetical prowess. One’s fasting and abstinence should always be proportionate to one’s health and state in life. The value of fasting and abstinence is that they allow us to feel a certain emptiness. They put us in touch with our real hunger: the hunger that only God can satisfy. Ultimately all fasting and abstinence have a Eucharistic finality. “He who comes to me shall not hunger, and he who believes in me shall never thirst” (Jn 6:35), says the Lord. Fasting is doing what it is supposed to do when it sends us hungering and thirsting to the Word of God and to the Holy Mysteries of the Altar. 2. Almsgiving opens the heart to the other and, in so doing, opens the heart to Christ. Again, the fruit of almsgiving is spiritual joy. There is joy in giving something away. There is joy in going without what is superfluous so that another may have what is necessary. Lenten almsgiving invites each of us to ask some hard questions. Do I have the use of two or three or four of anything when I could easily make do with one? Saint Basil says that the one who accumulates things, storing them up in closets and hiding them away in trunks, is robbing from the poor of Christ. Almsgiving is a liberation from the hoarding instinct. The compulsion to squirrel things away, apart from being neurotic, is a lack of trust in the Providence of God. Almsgiving frees our hands to receive what God desires to give us. “He has filled the hungry with good things, and the rich he has sent empty away”(Lk 1:53). 3. Silence is integral to a holy Lent. The monastic tradition values silence for two reasons. “In much talk thou shalt not escape sin” (Pr 10:19). Avoiding sin is by itself an excellent reason to be silent. But there is more. Silence allows the heart to hear the Word and to be pierced by it, “for the Word of God is living and active, sharper than any two-edged sword, piercing to the division of soul and spirit, of joints and marrow, and discerning the thoughts and intentions of the heart” (Heb 4:12). God speaks to us even now as he spoke to the prophet Elijah, “in a still small voice” (1 K 19:12). If you would hear the voice of God, be silent. 4. Keeping vigil is a traditional practice that, like fasting and abstinence, must be adapted with prudence and discretion to the real possibilities of each one. Poor Clares and Carthusians arise in the middle of the night to keep watch in prayer. Trappists are in their choir stalls well before the rising of the sun. Carmelites stay up late, chanting their Vigils while most of us are turning down the bedcovers. What then does keeping vigil mean for us? It has to do with making time for God alone, with the sacrifice of time for God alone. We are possessive of our time. Demands on our time can make us resentful and anxious. We fret over time, fearing that we will not have enough of it to carry out our tasks. We forget that he who multiplied the loaves and fishes for the multitude, is no less the Lord of hours and minutes too. Time given to God alone makes all else possible. Knowing that there is nothing more precious than our time, God asks us to sacrifice it for him, that is, to give it over to him that he might fill it with his presence and make it holy. The sacrifice of time for God alone is an offering of pure nard poured out and “filling the house with its fragrance” (Jn 12:3). 5. Lectio divina is the fifth and final Lenten discipline. Today’s Communion Antiphon focuses on lectio divina: “He that shall meditate day and night on the law of the Lord, shall bring forth his fruit in due season” (Ps 1: 2-3). Without lectio divina, fasting makes us cranky, almsgiving makes us feel deprived, silence makes us feel alienated, and keeping vigil is boring. Our Lenten lectio divina can be prolonged in making the Way of the Cross; in communion with the sorrowful compassion of the Mother of Jesus; in gazing wordlessly on the suffering Face of Christ; in adoration of the Blessed Sacrament. Lectio divina is the ground of every other form of prayer. The five Lenten disciplines that tradition gives us — fasting and abstinence, almsgiving, silence, keeping vigil, and lectio divina — dispose the heart to being pierced and broken, even as the Heart of Jesus was pierced and broken for our sakes. Practice them wisely, practice them generously and, by the grace of the Holy Spirit, you will, after forty days, arrive full of joy at the glory of the Cross and Resurrection.